The DVD list sees new releases in its top spots; Travis Barker and Rise Against both make strong debuts on the CD chart; and James Patterson and Neil McMahon come out on top for fiction. Midwest Tape boasts over 25 music standing order plans. Our most popular plan is the Hit Makers plan, which consists of upcoming albums expected to become major hits by popular artists. But how do we predict this? How do artists become Hit Makers? And how do they get the boot? The Hit Makers plan consists of upcoming releases from artists who have a previous album that has been certified Gold, Platinum, or Multiplatinum in the past five years by the Recording Industry Association of America (RIAA). Artists receive Gold certification after 500,000 record sales, Platinum after one million, and multiplatinum after two million. These honors are based on domestic—not worldwide—sales, and an artist has to achieve certification within three years of his or her album’s release. Thus, any albums released before March 2008 that just reached Gold status would not be included in our Hit Makers plan because the album is now more than three years old. Once an artist joins the Hit Makers Club, he or she isn’t guaranteed a space forever. If an artist fails to produce another certified album within five years of their previous certified release, then that artist will get the boot from the Hit Makers plan. Interested in turning your library into a Hit Makers Club? Sign up for our Hit Makers standing order plan, and every two weeks you’ll receive a cart loaded with upcoming releases from certified Hit Makers. You can decide whether you want to receive albums from all Gold, Platinum, and Multiplatinum artists, just Platinum and Multiplatinum, or only Multiplatinum. 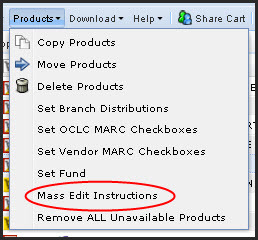 Additionally, you can set your cart quantity at any amount and adjust titles and quantities any time. In summary, the plan (like all of our standing order plans) is super flexible and there’s absolutely no obligation to order. To learn more about or sign up for our Hit Makers plan, contact Chris Shope at 800.875.2785 or cshope@midwesttapes.com. You can also view our Music CD Customized Standing Order brochure and our Hit Makers list. After months of hype, the excitement surrounding eBooks may be dying down. Even though eBook sales jumped 112% in October from a year prior, they posted their slowest growth rates yet.1 These slowing sales leave me wondering if consumers are starting to see through all the publicity surrounding digital books. After scouring through numerous blogs and news articles, I’ve found that no format—print or digital—is perfect, but what are the advantages and disadvantages of both print and digital books? Check out this list of key points you should take into consideration when selecting titles from the two formats for your library. Libraries can incorporate new digital material into their collections anytime if purchased through an online digital material vendor. Through these providers, libraries can add eBooks right to their catalog website. Printed materials, on the other hand, while still purchased online, are at the mercy of shipment and delivery. Whether you prefer print or digital there will always be titles that are not available. It is cheaper and easier for authors to self-publish eBooks, so some have started publishing their work only in this format. However, there are also print books that have not yet been converted to digital, and there’s a chance they may never be. To access an eBook, you need an eReader which can cost anywhere from $99 to over $500. Some libraries preload these devices with eBooks and then loan the device. The cost can add up, though, if your library is buying multiple devices. They also may use Overdrive, a downloadable audiobook program for purchase by public libraries, to distribute eBooks. This service requires a single annual participation fee ranging from $600 to $6,000 based on the population of the library’s service area. Additionally, libraries pay per eBook title, which varies in price. These titles are encrypted with DRM and are therefore only usable on specific devices. 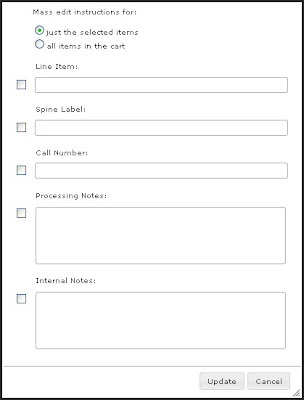 Patrons are limited to a certain number of copies of the material, and after the 14-day loan period, the files disappear from the device, requiring a new checkout rather than a renewal. eReaders are capable of storing thousands of eBooks on a tablet smaller than a piece of paper. Therefore, libraries can preload readers with whole series or read-alike books. They can also house entire collections on hard drives, thus saving shelf space and allowing room for other resources like audiovisual materials, Internet-accessible computers, Wi-Fi access points, and reference desk materials. However, digital books lack the aesthetic appeal of stacked books and the refreshing smell and feel of cracking open a physical book. Additionally, browsing via an online catalog doesn’t necessarily have the same appeal as wandering the shelves and stacks. Although eBooks aren’t susceptible to the traditional wear and tear of printed books, eReaders can still be dropped, be exposed to extreme temperatures, or experience data corruption. Additionally, DRM makes it difficult to back up eBook files for future retrieval. However, eBook file formats will constantly change due to advances in technology and proprietary formats. While PDF and EPUB are standard formats now, this could easily change over time, risking the readability of certain works that may not be compatible with future formats. While eBooks may need to be copied or converted in the future, printed books will always remain readable. Printed books use three times more raw materials and 78 times more water to produce than eBooks.7 However, eReaders are not biodegradable like printed books and the incorrect disposal of batteries can wreak havoc on the environment. Basic functions of digital readers make it easy to alter text and read in low or no light. They have the ability to display motion, change the size and style of fonts, use text-to-speech software, and search for key terms and definitions. Digital books also allow the user to highlight, bookmark, and annotate text. If a book has specific formatting, though, it may be lost when converted to a digital file. Of course, without a charged battery, none of these functions are accessible. However, in spite of recent technological advances, it is just as easy to annotate printed texts without eReaders, as long as you don’t mind marking up your books or making copies. In fact, according to the New York Times, students still cling to paper textbooks in today’s digital age. Because both formats have their pros and cons, it may be best for libraries to lend material cohesively by bundling print and digital books or providing eBooks as a supplement to print copies. An example of this method is Tantor’s Audio & eBook Classics, wherein the publisher bundles companion eBooks on PDF for over 300 of their classic audiobooks. You can find these titles on Midwest Tape’s website by SmartBrowsing Tantor Audio & eBook Classics. Do patrons at your library prefer one format to the other? What feedback have you received from patrons and librarians? Over the past two centuries, library cataloging has moved from book to card to Online Public Access Catalogs. Now, as we start a new year, cataloging standards might see a change once again. Say hello to Resource Description and Access (RDA). Created by the Joint Steering Committee (JSC), RDA intends to make library collections more logically organized and easier to scour. However, as the new cataloging method goes through testing, mixed reviews are starting to form. 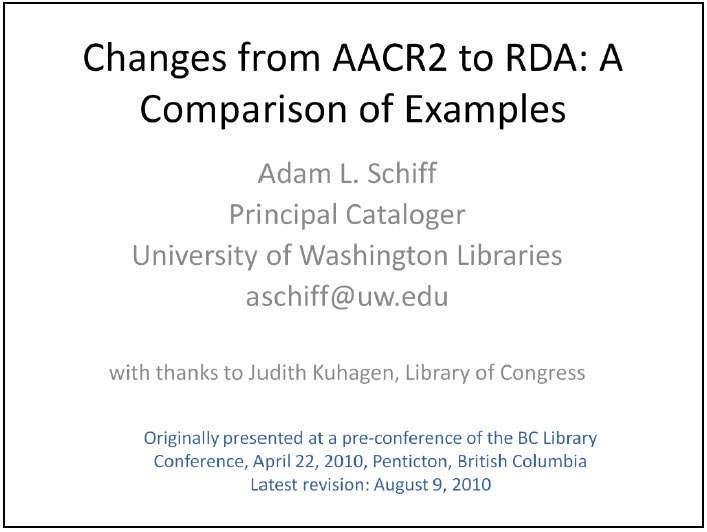 Developed in 1978, AACR2 was created for an environment dominated by the card catalog. Because of this, it is not as capable of handling metadata from an influx of digital resources or linking metadata from multiple formats like hardcover and print books and abridged and unabridged audiobooks. In order to resolve this problem, the JSC has coded RDA to gather information in a significantly different manner. As you can see, some specific punctuation marks are transcribed to RDA just as they appear on the source. 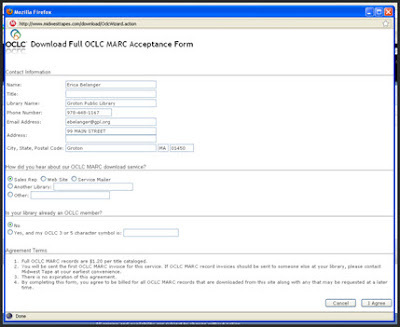 Click here for more comparisons of MARC records created by AACR2 and RDA. 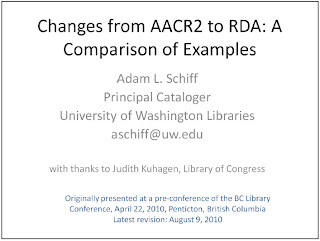 Catalogers in libraries and other communities can use RDA. This creates a solid alignment between RDA and the metadata used by archives, museums, publishers, educators, book dealers, and ILS vendors, and supports data sharing across metadata communities.1 As a result, catalogers can cluster bibliographic records to express different formats, abridgments, translations, and editions. The more communities share, the easier it is to search and find. Currently, select libraries and organizations, along with the Library of Congress, National Library of Medicine, and the National Agricultural Library, are testing RDA to make sure the new method will cohesively blend with prior records. If all goes well, the JSC expects an official release date in April of 2011.5 Libraries will have a choice in whether they adopt the new method into their workflows, but if your library obtains bibliographic records from an entity that accepts RDA, you will have to choose between switching to RDA to get your records, converting RDA back to AACR2, or having a mixed catalog. As systems change, workflows will need to be updated. 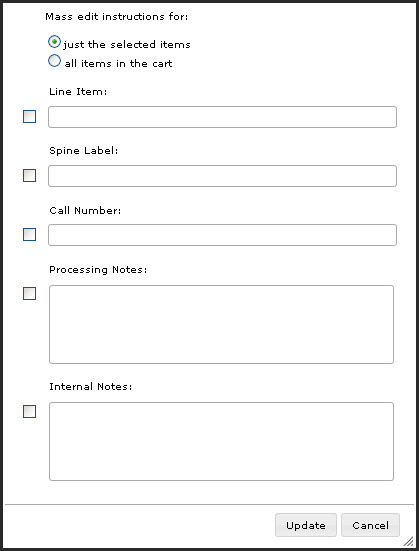 The new process is principle-based rather than case-based, so users will not need to learn specific rules. Instead, they will have to apply judgments based on a set of new standards. In preparation for the switch, the Library of Congress has made training materials available via their website. Is your library participating in RDA testing? How do you feel about the new cataloging method? Do you think it will be as effective if only a number of libraries adopt the format? Share your thoughts and opinions here as comments.